It may seem odd that we have chosen a goalless draw for a memorable match, but the simple fact is that this game had the largest recorded crowd ever at Highbury. This was during the period of Arsenal’s dominance of English football in the 1930s and both teams were vying for the title with only two points separating them. The anticipated ‘match of the season’ turned into a dogfight as both teams’ defences held sway, and combined with a very cold wind to stifle attacking play and make good football difficult. The Sunderland defence, marshalled by Bill Murray, was particularly strong and some robust challenges earned a number of cautions which managed to knock the rhythm out of the Arsenal forwards. 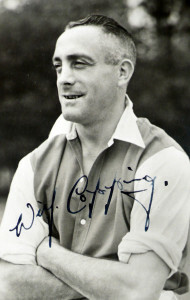 Jack Crayston and ‘man of the match’ Wilf Copping were the pick of the Arsenal team with equally strong tackling and decent passing, and they did enough to keep the lively Sunderland forwards of Bobby Gurney and Bert Davis at bay, though the best chance of the game came in the first half when Gurney hit the crossbar after a rasping shot had Frank Moss well beaten, while Arsenal’s best chances fell to Ted Drake. However, in the second half, Alf Kirchen created two chances, the first was his own when a snap shot was deflected by a defender, and the second when he set Bobby Davidson up for a clear opportunity but he scuffed his shot. Overall, though, Arsenal’s attacking play misfired as Alex James was out of sorts and the usual service to Cliff Bastin and Drake did not materialise at any point in the game. The individual duel on the flank between outside left Jimmy Connor and George Male ended with honours even, as the elusive Scot could fashion nothing past the Gunners right back. Neither keeper had much to do with only half a dozen shots aimed at either goal, and Sunderland managed to become the first team since Portsmouth in late December to take points off Arsenal at home. 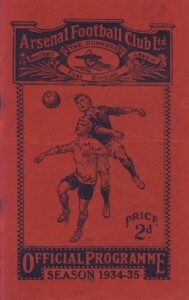 Arsenal: F Moss, G Male, E Hapgood, J Crayston, H Roberts, W Copping, A Kirchen, B Davidson, T Drake, A James, C Bastin. The Arsenal did the League home and away double over both Liverpool and Everton that season which may have coloured BNK’s views somewhat! Bobby Gurney the Sunderland centre-forward in this match is the club’s most prolific striker in their history with 228 goals in 390 first team matches. On the train down to London prior to this game he was presented with a pen and autographed sketch by grateful Sunderland directors in celebration of his recent 150th goal for the club. In the following 1935-36 season his goals assured Sunderland were to finish as League champions while Arsenal, concentrating on winning the FA Cup, languished in 6th. And the season after their League triumph he scored the opening goal in Sunderland’s first ever FA Cup final victory at Wembley in 1937. 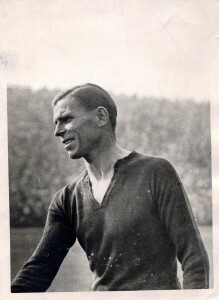 Sunderland’s all-time second highest scorer with 222 goals is Charlie Buchan, who famously appeared for both clubs in his illustrious career. Another player from Sunderland’s all time greats list who appeared in this game was Raich Carter, who is widely acknowledged as one of the most skilled Black Cats ever, and was the fulcrum of their 1936 League and 1937 FA Cup wins. Unfortunately, his career was blighted by the Second World War, and despite playing wartime games for the club he moved to Derby after the conflict ended and helped them to win the FA Cup in 1946. A tragedy occurred at the ground as a long term Arsenal supporter died of a heart attack during the game. 71 year old William Jenner, of Sladedale Road, Plumstead was a gateman at Highbury and had been supporting the club since the very early days when the club played in Plumstead. 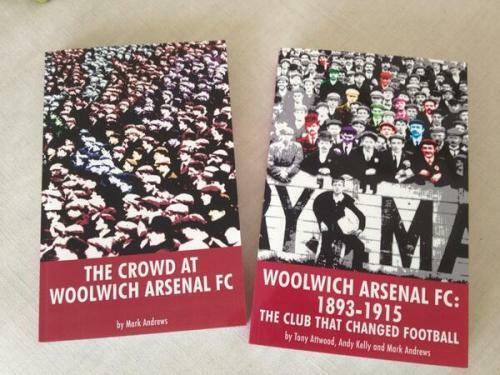 He was an original shareholder of the Woolwich Arsenal Football and Athletic Company, Limited in May 1893 and he also held a share in the new Arsenal company formed in 1910. 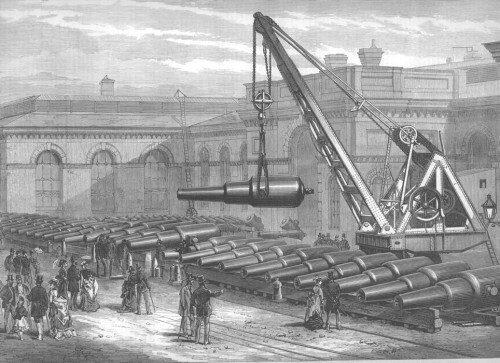 Prior to retirement he was a crane operator at the Royal Arsenal Ordnance factory, moving large guns around. A true patron of the club who did not let the move across the Thames in 1913 affect his support for the Gunners. While Arsenal were destined to be League champions and Sunderland runners-up in 1934-35, Spurs were relegated to the Second Division after finishing bottom of the table. This cartoon shows how close Sunderland were to Arsenal at this stage, though at the end of the season Arsenal had extended their lead to four points. Arsenal wrapped up the League in the away game on 22 April at Middlesbrough which they won 1-0, and, in fact, only lost one game after the Sunderland match. This was the final game of the season at home to Derby and was a dead rubber as the title had already been won. However, it did mean that Derby were the only team to beat Arsenal both home and away that season. 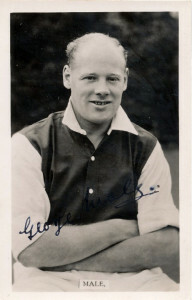 Ted Drake was the leading goalscorer in the First Division that season with 42 goals in 41 appearances, still a club record for most goals scored by an Arsenal player in one season. This match was Alf Kirchen’s first home game for Arsenal since being signed from Norwich. A few days previously he had made his debut at White Hart Lane and scored twice in the 6-0 destruction of Spurs, which was the largest away win for any team in the league that season. The whole Sunderland team and various officials were invited to be Arsenal’s guests at their celebration dinner on 7 May 1935. After the event in London the Black Cats embarked on a tour of Spain, playing in Barcelona and Madrid. After the season had ended and Arsenal had fully celebrated their Championship hat-trick, the summer of 1935 saw work began to cover the Laundry End (later known as the North Bank) of the ground. Part of the work included relocating the famous clock to the South terrace.